Tahini is a paste of ground sesame seeds. In Middle East, tahini is made of hulled seeds; whereas in East Asian it is made of unhulled seeds, and is mainly called "sesame paste". Tahini is a major component of hummus bi tahini and other Middle Eastern foods. In Asia it is also an ingredient in some Chinese, Korean, and Japanese dishes. Tahini is becoming more common in European cuisine and is used as a spread or as an ingredient in sauces, dips and salads. 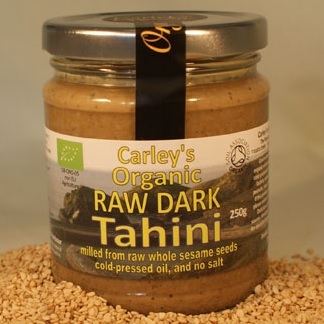 Tahini has a high content of vitamin B1 (Tiamine), calcium, magnesium, zinc and iron. Cool milled below 44°C from mechanically hulled sesame seeds, with cold-pressed fair trade sesame oil pressed from fair trade seeds from Mali, and no salt.